The Internet-of-Things phenomenon has brought along with it a new computing paradigm – one where energy consumption, rather than performance, is the key metric. A wide variety of IoT sensor-based applications, such as remote surveillance, environmental scanning, and traffic monitoring, do not require fast sensing, and the systems are often put in idle mode between sensing events to conserve power. 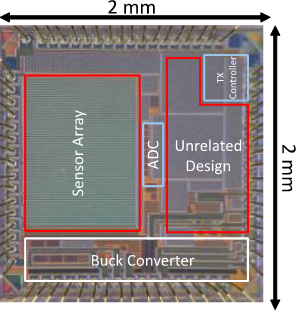 Researchers in Prof. Mukhopadhyay’s GREEN lab have gone one step further, and designed an image sensor SOC which actually generates energy during this idle mode when frame capture is not required. Fabricated in 130nm CMOS technology, the image sensor SOC contains a 64×48 array of energy harvesting pixels that can be configured in either imaging or harvesting mode. When idle, the array is able to harvest and store energy in an off-chip battery or super capacitor, which offers the potential for self-powered operation where the system can be run with energy harvested solely from the chip. Measurement results show peak harvested power of 5.8µW, which equates to the system being able to process a frame every 1.3 seconds if operated solely from harvested energy. Compared to other harvesting sources such as thermoelectric generators or photovoltaic cells which require additional hardware and impose increased form factor concerns, this solution presents an integrated approach towards implementing self-powered sensor nodes that can be deployed in remote locations where battery replacements are not always feasible. This work has been accepted for presentation at the 2018 IEEE SOI-3D-Subthreshold Microelectronics Technology Unified Conference (S3S).